when leo's coney island at southport & cornelia closed, i was sad. i loved it there. 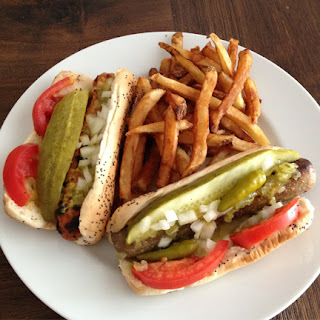 hey, i grew up in chicago, which means i grew up eating chicago-style hot dogs ... and sometimes, you (aka, me.) just can't ignore that hankering ... leo's used to have the perfect vegan chicago-style hot dog. but fear not ... picture this : it's sunday at lunch time. josh & i obviously have not gone to the grocery in weeks (come on, you know i don't cook) ... and there's no food around. i turn to grubhub, type in "vegan delivery" & see what happens. enter huey's hot dogs, located in andersonville ... now today, i wouldn't say i was actually craving a vegan hot dog. but eating one is so rare, i couldn't pass it up : "whether you want a classic chicago-style hot dog, a specialty sausage, or one of our many vegan specialties, huey’s has a huge menu to explore." woohoo! mustard, onions, relish, pickle, tomato, sport peppers & celery salt. note : you see NO KETCHUP on that list. this is important. ok, clearly i did not need two dogs here ... but i had never had a vegan beer brat and wanted to try a little of both. sue me. both were freaking.amazing. exactly what a delicious chicago-style dog should taste like. one of the huey's hot dogs yelp reviews says that this make for some awesome vegan hangover food. this time, i wasn't in need of a hangover cure ... just regular old food. but either way, i highly highly recommend.